I think we all know who Abraham Lincoln is, yes? One of the most famous presidents of the United States of America? 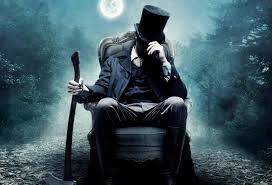 Well, did you know that he was also a vampire hunter? This historically accurate drama shows how Lincoln came across the existence of vampires but was taught to kill them using a variety of techniques. But as his life continues, he discovers that his life can be more valuable in politics and the pursuit of freedom of slaves. Ok, clearly not a historical document. But whoever came up with the hilarious idea of combining one of the great historical figures with vampires is a genius in my mind. This could have been a schlock horror disaster like Sharknado but someone actually bothered to write a script – and something fairly decent. Plus there is an awesome scene with an old-school train and a whole heap of fire – on par, I’d say, with the cool old train sequence from Back to the Future 3. If the sight of this title makes you angry, don’t watch it. It’s exactly what it says on the box. And good.